← Me and my Blog ! Yesterday in Press Conference at Maharashtra Sadan Delhi, Respected Annaji Hazare publicly declared that he never ever spoke to me or met me on the issue of re-structuring of Core Committee and forming a new Pan- Indian organization with ‘immediate effect’. Annaji added that I am speaking of my own mind. One Hindi Channels senior journalist called me an agent of Central Minister. Everybody in media present there at Annaji’s Press-Conference laughed at me. Actually as I was saying again and again Annaji was fed up with the core team and especially these four members (though he won’t say this in public as he is decent enough ) wanted to re-structure core team and build Pan-Indian organization. But this letter (scanned copy) is hand-written by Anna Hazare and signed by Annaji Hazare on 23rd of October 2011 at 2:30 pm when he made up his mind to get away from Kejriwal, Bedi and Prashant Bhushan and their pawns in Core Committee. Attached is its English translation too. Annaji himself spontaneously wrote this blog. Sureshbhau Pathare was present there. He tried to stop Annaji but Annaji was unstoppable. Then Sureshbhau requested me not to upload Annaji’s this particular blog on his blog at least immediately. Then from 24th to 30th how things happened chronologically, how Kejriwal, Bedi and Prashant Bhushan manipulated Kumar Vishwas letter, how I spoke to channel about Annaji’s plan, how Kejriwal, Bedi and Prashant Bhushan suppressed Annaji’s wisdom in front of on 30th October at Ralegan Siddhi and then after this Team Anna left, Annaji asked me to stay back and in one-to-one close door meeting he signed an order to hold Core Team and asked me to put on blog which I haven’t uploaded that order yet (I will reveal every proof and happenings in support of my statement). How ‘Kejriwal, Prashant Bhushan and Ms. Bedi were so undemocratic, fascist and disrespect Annaji’s thought and thrust their so-called Core Committee meeting on Annaji and overpowered me when I fought back for Annaji because Annaji is fragile, his Blood Pressure is fluctuating and is unwell. Dr. Dharmadhikari was present there. He told me to take care of Annaji as he is weak. Dr. Dharmadhikari suggested me that Annaji should be kept happy. So to avoid stress and strain I kept aside Annaji’s document. After 23rd what happened and above mentioned all the documents and disrespect for Anna’s will, all pages and proofs and logic which describe and illustrates opportunist mind of Kejriwal, Prashant Bhushan and Bedi. I will reveal one by one the above documents and take Press Conference in Delhi at the same place where Kejriwal and company arranged Annaji’s Press Conference and through Annaji challenged my integrity and honesty. I am not happy writing this letter to all of my country men but analogy of 3 or 4 representing 120 Crores Indians with non-transparency and undemocratic behavior is itself a paradox when Annaji is fighting against neo-feudalism, monarchy and democratic rights of every Indian. I appeal to the youth and people of this country that Annaji is very precious to us so he should be protected from evil forces. My great amount of love and regards to Annaji and I salute his consistent fight of 30 years. The nation wants his leadership for many years to come. Pan -Indian apolitical organization and youths like Bhagat Singh, Rajguru and Sukhdev and not like (Kejriwal, Prashant Bhushan and Bedi) will have to fight this battle of anti-corruption for Annaji without taking in to consideration a self-proclaimed 25 members (undemocratically and unconstitutionally) on the streets of India. Very soon, I am thinking on the lines of restructuring the Core Committee. 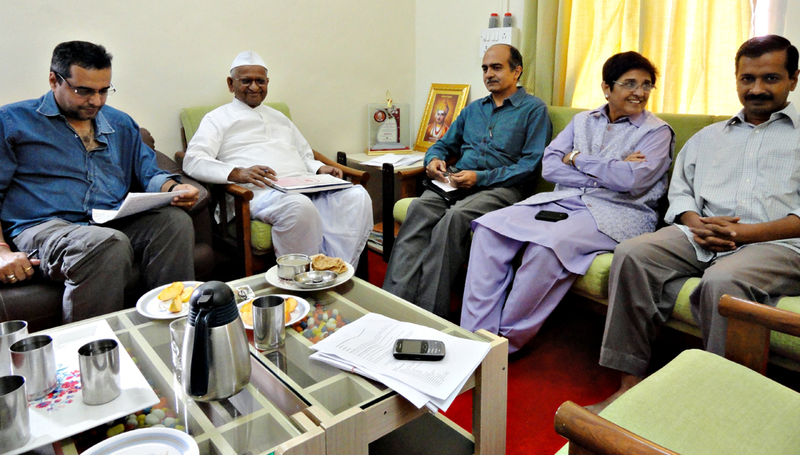 I am hereby informing all the members of Team Anna. The reason being I have received letters from all over the country and states in favor of this agitation saying, ‘I am ready to pledge my life for this noble cause.’ The letters are written by retired Supreme Court Judges, retired High Court Judges, Brigadiers and Colonels from Army, Professors and Principals and educated people with idealism. Soon, these people will be categorized taking in to consideration the type of work they are willing to do. I have decided to put to use such people from all over the country and states who are willing to do voluntary service to the society. The applicants have no expectations whatsoever and have applied with the aim of serving the nation and the society at large. Now we need to ensure these people and expand the members of Team Anna. Also we need to have able people and form a working committee. All members from every state will be given preference when forming a Core Committee. For effective communication they will be linked on-line. The expenses of food and shelter for say 100 volunteers will be fulfilled by donations from people having clean character. It will enable us to build an effective agitation throughout the country. We have a long battle to fight ahead. In order to have a corruption-free India we can put all this to use.The people who have been alienated from this agitation…. I believe that not only India but for other countries too this will serve as a good example to rid their country off corruption. We do not want to form organizations but create volunteers on District and State level. When there is an agitation happening at national level you will see people rising for the occasion from every state. In this struggle there won’t be a President, a Secretary or a treasurer. People will only work in the capacity of volunteers. Naturally we will need financial aid. No cash will be accepted. Donations in form of cheque or draft are welcome. But it should come from people having belief in lakhs of martyrs like Bhagat Singh, Rajguru and Sukhdev. मी लवकरच कोर कमिटीची पुनर्रचना करण्याचे ठरवीत आहे. त्या साठी टीम अण्णांच्या सर्व सभासदांना ही कळवीत आहे. कारण देश भरातून सर्व राज्यातून या आंदोलना साठी ‘मी जीवन समर्पित करायला तयार आहे’ अशा प्रकारची पत्र आलेली असून त्या मध्ये निवृत्त सुप्रीम कोर्ट जज्ज, निवृत्त उच्च न्यायलय जज्ज, सैन्यातील ब्रिगेडीयर, कर्नल, प्राचार्य-प्राध्यापक आणि सुशिक्षित ध्येयवादी लोक पुढे आले आहेत. ह्या सर्वांची लवकरच दोन ग्रुप मध्ये बैठक घेऊन ते काय काय करणार याचा अंदाज घेऊन देश भरातून विविध राज्यान मध्ये स्वयंसेवक होऊन कार्य करायला तयार आहेत अशा लोकांचा उपयोग करून घेण्याचे ठरविले आहे. आलेल्या अर्जदारांची कोणतीही अपेक्षा नाही फक्त देश सेवा आणि जन सेवेच्या भावनेतून च त्यांनी अर्ज लिहिलेले आहेत. अशा सर्व लोकांची खात्री करून आता टीम अण्णाचे सदस्य वाढवावे लागतील. त्याचं प्रमाणे वर्किंग कमिटी मध्ये काही चांगल्या लोकांना घेऊन कमिटी करावी लागणार आहे. कोर कमिटी मध्ये सर्व राज्यांच्या सभासदांना प्राधान्य दिले जाऊन बांधणी करणार आहे. या सर्वांचा समन्वय राहवा या साठी ऑन-लाईन ने जोडले जाणार आहे. सर्व साधारण १०० स्वयंसेवक हाताशी आले तर त्यांना जेवण व राहण्यासाठी जो खर्च येणार आहे त्यासाठी प्रामाणिक स्वच्छ चारित्र्याचे देणगीदार पाहून त्यांचा खर्च भागविणार आहे. त्यामुळे ह्या आंदोलनाची देशभर चांगली बांधणी करता येऊ शकेल. पुढे खूप दूरची लढाई लढावी लागणार आहे. भ्रष्टाचार मुक्त भारत निर्मिती साठी या सर्वांचा चांगला उपयोग होऊ शकेल. ज्या लोकांना ह्या चळवळी मधून बाजूला केले आहे… मला विश्वास वाटतो कि देशात नव्हे तर जगातील अनेक देशांना भ्रष्टाचार मुक्ती साठी चांगलं उदाहरण निर्माण होईल. आम्ही जिल्हे, राज्य स्थरावर संघटन उभं करायचं नाही तर स्वयंसेवक निर्माण करायचे आहेत. ज्या ज्या वेळी देश पातळी वरील आंदोलन होईल त्या त्या वेळी प्रत्येक राज्यातून जनता उभी होईल. या चळवळी मध्ये कोणी अध्यक्ष, सचिव, खजिनदार अशी पदे राहणार नाहीत. फक्त स्वयंसेवक म्हणून काम करणारे कार्यकर्तेच असणार आहे. अर्थात या साठी आर्थिक मदतीची गरज पडणार आहे. Cash ने मदत घेतली जाणार नाही फक्त चेक किंवा ड्राफ्ट नेच मदत घेतली जाईल जेणे करून स्वयंसेवकांचा खर्च भागू शकेल. या आंदोलना मध्ये पक्ष पार्टी सोडून देश हिता साठी स्वयंसेवक म्हणून कुणी आले तर त्यांचे ही आम्ही स्वागत करू. मात्र ते स्वच्छ आचारांचे, स्वच्छ विचारांचे ‘भगत सिंग, राजगुरू आणि सुखदेव सारख्या लाखो शहिदांची आठवण ठेवणारे असावेत.